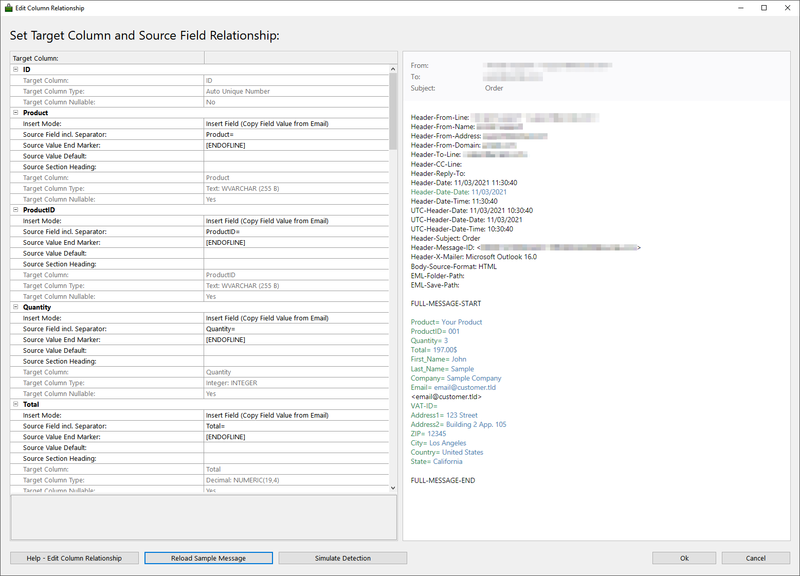 The setup of the email extraction ("Source Field Relationship") is based on a sample message. First send a sample message to the specified email address and load the sample message into the program. Inbox2DB auto-detects matching field names (if any). Otherwise you can setup the fields using "Source Field incl. Separator" and "Source Value End Marker". Click on "Simulate Detection" to verify the settings. You can verify the mapping in the preview on the right. Source fields are highlighted in green and the value in blue color. Inbox2DB is a software product for Windows PC and Server. Inserting email (file) attachments into the target database is just as easy as mapping the data from the email body. Simply select the desired attachment from the "Insert Mode" list. You can insert any type of file attachment into your database, whether it's pure binary data or documents. In addition to file attachments, it is also possible to insert the complete email source code into the database. The email source code is in the standardized EML format and contains both the email header and the message body as well as all file attachments in coded form.